A fast and effective way to get rid of overgrown hair, sugaring is a great alternative hair removal technique for the whole body, and is especially effective for those hard-to-reach or more susceptible areas where hair is fine and skin is sensitive. A simple concoction of sugar, lemon and water heated together until caramelised, the age old hair removal technique of sugaring is an easy and effective way to remove unwanted hair from any part of the body. Formulated thousands of years ago, sugaring can be linked all the way back to ancient Egypt, and is often considered the safest hair removal solution due to its simple and all-natural ingredients. Thick and syrup-like in its consistency, the technique is very similar to regular waxing, though the translucent layer applied to the skin is very thin compared to other waxes. Unlike hot wax, the sugar paste doesn’t stick to your skin, but clings to each hair individually. 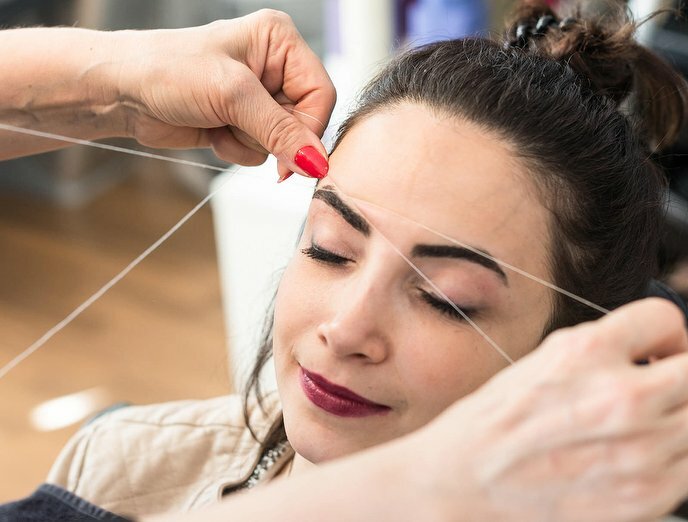 This means that when the hair is quickly pulled out from the root, it doesn’t bruise the skin and is often considered less painful than other forms of waxing. Also, because the sugaring paste is only slightly warm, there is less chance of skin irritation and redness that can be associated with regular waxing, plus the paste is totally soluble in water, which means any sugary stickiness can easily be removed with soap and water once your treatment is over. No more sticky post-wax patches! Formulated thousands of years ago, sugaring can be linked all the way back to ancient Egypt, and is often considered the safest hair removal solution due to its simple and all-natural ingredients. Dictated only by your personal preference, just like a normal waxing session the solution is smoothed onto the skin with a spatula, and then the fabric strips are applied firmly over the chosen area and then quickly removed in the opposite direction of your hair growth. The alternative method involves rolling the ball of sugar wax upwards from your ankles to your knees, which lifts the hair as it goes. It also means you can repeatedly go over areas that need a more stubborn do over. Depending on how fast your hair regrows, results can last up to three weeks, and with time hair should grow back finer, softer and less often. There might be some initial redness and bumps immediately afterwards, but these should subside after an hour or two and can be minimised by applying cold flannels to the skin. So if you’re sick of shaving but waxing scares you senseless, sugaring could provide you with the perfect happy medium. Like any form of hair removal, there’s always the possibility of minor pain but as long as your chosen hairs are long enough, you should be saved from too much discomfort. Also ideal for more sensitive areas of the body such as the bikini line or face, sugaring is a great hair removal option for the entire body.